BOTOX® Cosmetic is a simple, non-surgical treatment that can smooth moderate to severe frown lines. It is the only treatment of its type approved by the Food and Drug Administration (FDA). Within days of treatment there is a noticeable improvement in those persistent lines between the brows. Results last up to 3 months and may vary. BOTOX® Cosmetic is a purified protein which reduces the activity of the muscles that cause frown lines. 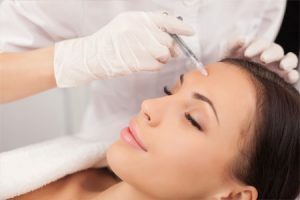 Patients who typically request Botox have noticed the effects of age, gravity, exposure to sunlight and the stresses of life all taking their toll on a person’s face. Deep creases often develop around the nose, eyes, and mouth causing unsightly wrinkles which make a person look older. Such factors may affect an individual’s confidence. BOTOX® can help such individuals restore youthful vibrance and energy to the face. The effects of time are virtually undone. BOTOX® is often used in conjunction with other procedures such as laser skin resurfacing, dermal fillers, anti-age cream and surgery. Once your goals have been determined we will set a date for your procedure and detailed instructions on how to prepare. Individuals may also consider fat injections. In a fat injection, fat is removed from another portion of the body and then injected to fill in wrinkles. Recovery is usually quick and post-recovery discomfort is minor. Swelling and redness usually subsides within about a day.